The endless variety of savory, salty, cheesy and sweet flavors coating snack foods yields a texture and taste combination to suit just about any consumer's discriminating palate. Snacks have come to occupy a premier place in the American diet that carries nearly as much weight as any of the "three squares" we allegedly structure our diets around. In many instances, "snacks" really should be thought of more as "substitute meals." But there's a schizophrenic effect to snacks — they fall on either side of healthy fill-ins and indulgent munch. According to research group Global Industry Analysts Inc., world snack food sales will top a third of a trillion dollars by 2015. "The main factors fueling the market are income levels and consumer perceptions and demographics," reports the group's analysts. "The market is highly fragmented and intensely competitive, with an abundance of industry players in all categories from small to large." One of the biggest ingredient trends in snacks, and an ingredient that covers both of the bases outlined above, is nuts. When used in moderation as part of a well-balanced diet, this high energy food can supply more than just taste. Nuts contain the essential linoleic and linolenic fatty acids, dietary fiber, phytochemicals, vitamin E, and are an excellent source of protein and important minerals such as calcium, iron and zinc. Interested in learning more about Food Ingredients? Considering signing up for our Food Processing Flavors and Functional Ingredients e-Newsletter. Almonds are one of the most popular tree nuts in America and are sold in about 40 different forms. According to the Almond Board of California, the positive perception of almonds continues to grow among consumers, with this nut outperforming all other nuts by receiving high marks for attributes such as "healthiest," "crunch appeal" and taste. The board also noted that with all of the dietary research that has been done to date and the promotion of the health benefits of almonds, the general perception of consumers and health professionals now is a very positive one. Even as new and innovative uses for almonds appear on the horizon, the global demand for almonds continues to increase by 10 percent annually. "Besides the traditional use of chopped, diced and sliced almonds in cereals, granolas and bars, almonds have also been introduced as core ingredients in popular snack foods," says Jeff Smith, director for Blue Diamond Growers, Sacramento, Calif.
Two examples of such snacks using nuts as a base ingredient delivering taste and crunchy texture are Nut-Thins and Nut Chips. They are baked snacks and have several marketing advantages, such as zero grams saturated fat, no trans fats and being gluten-free. Nut Chips also contain whole grains from brown rice flour. Other nut-derived ingredients such as hazelnut meal and pecan meal have been incorporated successfully into two other Nut-Thins snack products. "We've seen good demand domestically for almonds in snack bars, fiber bars as well as mixed nuts and granola mixes," says Lori Coburn, director of Hughson Nut Inc., Hughson, Calif. "A specialty ingredient recently developed and generating increasing interest from the food industry is almond bran. Almond bran is 100 percent almond skin, and so is gluten-free. Because many healthful benefits of almonds are in substances found in the outer skin, almond bran was created to provide a product with these healthful benefits, and without the calories of fat." According to Coburn, almond bran provides almond flavor and nutrition in a concentrated form as a rich source of dietary fiber, almond sterols and essential minerals such as magnesium, calcium, phosphorus and potassium. "In fact, the total antioxidant capacity of almond bran is more than 13 times greater than that of almonds alone," declares Coburn. "Almond bran also contains nearly four times the levels of dietary fiber and has a high concentration of phytosterols — for example, 20 times the amount of stigmasterol," adds Robert Miltner, Nut-rition's vice president. "Almond bran is also a highly effective prebiotic, supporting the growth of probiotic bacteria in the digestive tract." Although the need for lowered sodium in the diets of healthy people is controversial, consumer demand, continued pressure from the self-appointed watchdogs and increased market pressure continue to keep sodium reduction pressure on the food industry. According to the International Food Information Council Foundation's 2012 Food & Health Survey, 57 percent of Americans actively compare sodium in foods and choose the item with the lowest amount. "We have completed some consumer research over a year ago regarding their perceptions of sea salt," says Jackie Van Norden, product line manager of food processing for Cargill Inc., Minneapolis. "It was noted that 48 percent of consumers believe sea salt has less sodium than 'regular' salt and 53 percent believe that it has more taste intensity than 'regular' salt. We have seen the trend of adding sea salt to confection items for the past several years. This goes beyond dark chocolate and includes milk chocolate, caramel and baked items as well." Van Norden points out that, for many applications, the particle size of salt does matter in a consumer's perception of taste. "One example is salty snacks, which generally have salt applied topically on their surface," she explains. "The solubility rate of a salt will impact the salty flavor burst. "One of the factors that impacts how quickly salt dissolves or solubilizes is the particle size," she continues. "Smaller particles have more surface area and more surface area means more points of contact with the tongue and saliva, resulting in a quicker flavor perception. A larger granule of salt may not fully dissolve before being swallowed; salt that is not fully dissolved before swallowing means it is not fully tasted." Sodium reduction has historically been challenging to address in processed snack foods—without negatively impacting taste, functionality and cost. "Nu-Tek Salt Advanced Formula Potassium Chloride makes sodium reduction more cost-effective with the consistent results that manufacturers demand and this product allows for a clean label as well," says Don Mower, president and COO of Nu-Tek Food Science LLC, Minnetonka, Min. "The patented technology significantly minimizes the bitter flavor traditionally associated with potassium chloride, without needing to add flavors or masking agents – and delivers a salt intensity similar to sodium chloride. The advanced formula potassium chloride product works well in snacks, both as a topical application for chips or crackers and in the actual matrix of the snack. "It can be incorporated into a recipe as a one-to-one replacement for salt and also provides dietary potassium, which may contribute to reduced blood pressure and a decreased risk of cardiovascular disease," concludes Mower. 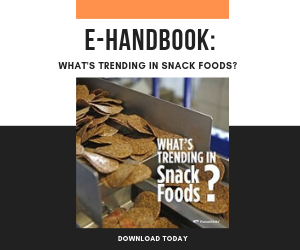 Gums or hydrocolloids serve a number of functions in snack foods including acting as binders in nutrition bars and enabling savory, salty, and sweet spices to be adhered to a variety of our favorite snacks. "Gum arabic can be used to help adhere spices to savory snacks such as nuts or pretzels, and this is often done in combination with dextrin and maltodextrin," says Janae Kuc, senior research and development scientist for Gum Technology Corp., Tucson, Ariz. "However, topical adhesion can prove to be tricky and certain items are harder to adhere spices to than others. Since gums are hydrophilic and need moisture to hydrate and become functional, the moisture content in the product and the processing conditions are key factors for success." Gum arabic also is a great film former and can create a film around small ingredient fractions such as spice particles; this in turn may help to prevent oxidation. "Since gum arabic is very low in viscosity," says Kuc, "it can be used at higher levels than many other gums. For example, to utilize gum arabic as a film former, a solution can be prepared at between 5 and 20 percent weight-for-weight." For nut clusters and granola bars there are a few different gum options for binding. "The choice will depend on processing," continues Kuc. "If the granola bar is a cold-process system, a blend of konjac and xanthan gum is a good choice. If the product is heated, the range of options becomes larger. Depending on the moisture content another option would be a carrageenan and xanthan blend or a blend of konjac and tara gum." While ingredients are demarcation lines between health and indulgence, technology tends to work on bridging the two. With that in mind, "air-popped" and "baked" are terms that have appeared with increasing regularity. "We launched Popchips to seize on a need in the market for great tasting snacks that also happen to be healthier," says Keith Belling, co-founder and CEO. "Fried chips are delicious but full of fat and calories, and baked chips just don't taste good." He notes that Popchips have less than half the fat of fried chips, fewer calories and no artificial colors or flavors that "give snacking a bad name." Two even newer LesserEvil products débuted at the 2012 Natural Products Expo East. Chia Crisps and Chia Pop. "The Chia Crisp is made with black beans and is puffed, not fried. The result is a gluten-free, low fat crisp high in fiber as well as protein," says Charles Coristine, company CEO. Chia Pop is made with organic, all-natural, gluten-free popcorn. Shearer's Foods Inc., Brewster, Ohio, is making its Riceworks line of all-natural whole-grain snack crisps from brown and wild rice. The crisps come in flavors of Sweet Chili, Sea Salt, Salsa Fresca, Tangy BBQ and Parmesan and are a good source of fiber at 2g per serving. They are wheat- and gluten-free, contain 12g whole grain per serving, and no trans fats or cholesterol. Sales of the products have expanded outside of the U.S. and into Canada and Great Britain. Kellogg Co.'s La Jolla, Calif.-based snack unit Kashi Co. continues to expand selections that run the gamut from bars and soft baked cookies to cereals and chips. Both the cookies and pita crisps are made with a blend of seven whole grains, which allows the company to claim that the products are good sources of fiber. The FDA allows a "good source" of fiber claim if the food contains 2.5-4.9g of fiber per serving. Going all out to hit each hot snack trend, Big Mouth Snack LLC, Boulder, Colo., created Snackle Mouth granola nut clusters in five flavors. "This healthy snack is not a cereal or granola but can best be described as all-natural ‘supersnack' nut clusters," says John Maggio, CEO and president. "Salty chocolate is our best-selling flavor. We use larger pieces of Kosher sea salt in the mix to give consumers a zing on their tongue." Driven by consumer demand, some trends might be fads, some might be a new paradigm. But with sales that could hit half a trillion dollars in the next 15 years, snack makers will be facing continued challenges to come up with the right crunch, the right munch for a snack-addicted world. If chips can include a full serving of vegetables, snacking can be a healthy part of your diet.